ORANGE COUNTY AND L.A. COUNTY RESIDENTS ARE INCREASINGLY FORCED TO MOVE OUT OF THE COUNTY IN WHICH THEY WORK DUE TO THE STATE’S HOUSING CRISIS, MAKING PROJECTS LIKE FULLERTON FAMILY HOUSING EVEN MORE NECESSARY, R.D. OLSON’S BILL WILHELM TELLS GLOBEST.COM. FULLERTON, CA—Orange County and L.A. County residents are increasingly forced to move out of the county in which they work due to the state’s housing crisis, making projects like Fullerton Family Housing even more necessary, R.D. Olson Construction’s president Bill Wilhelm tells GlobeSt.com. The firm began construction last month on Related California’s 55-unit affordable-housing project here, its fourth such project, and completion is expected in May 2018. The site is located at 335 East Santa Fe Ave., in close proximity to Downtown Fullerton and adjacent to the area’s train station. We spoke with Wilhelm about what makes this project unique and how affordable-housing construction compares to other multifamily projects. GlobeSt.com: What features and amenities will Fullerton Family Housing include? 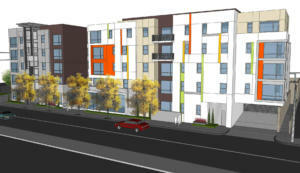 Wilhelm: Fullerton Family Housing will comprise 54 affordable units with one manager’s unit onsite. The five-story, 52,407-sqaure-foot complex will have studio, one-, two- and three-bedroom apartments available for rent, and includes a 24,000-square-foot parking garage. The walkability of the area offers a huge benefit for future residents, who will be able to walk to downtown Fullerton and access a train station adjacent to the site. The complex itself includes a courtyard, playground, BBQ area, on-site leasing office, bike storage room and laundry facilities. It is expected to be completed in summer of 2018. GlobeSt.com: What need do affordable housing projects like this fill for Orange County residents? Wilhelm: There is a full-fledged housing crisis in California, and this is especially the case in Orange and Los Angeles counties. Residents increasingly are forced to move out of the county in which they work. There is a severe shortage of affordable housing, and projects like these will allow more Orange County residents to be able to afford to stay in the area. Housing in prime, walkable locations with convenient access to public transportation gives residents more access to jobs, a better quality of life and allows them to spend more time with their families and less time commuting. GlobeSt.com: Is there anything unique about affordable housing construction in comparison with other multifamily projects? Wilhelm: Typically, affordable multifamily projects are in neighborhoods with smaller sites that can’t accommodate larger apartment complexes, which can present construction challenges. For this project, we are working with the railway, which is providing us with additional temporary storage space for building materials and setup. When building up to the property line, creative partnerships like this are essential to ensure construction is completed on time and under budget. Additionally, affordable-housing complexes typically are built with easy access to public transportation to accommodate families who may not have access to their own transportation. Proximity to a train station is a big reason we chose the site for Fullerton Family Housing. This contributes to a lessened need for parking spaces, which maximizes the number of units that can be built on the smaller sites. An affordable-housing site could have 80 units, but only 40 parking spaces. GlobeSt.com: How does this project fit into R.D. Olson Construction’s multifamily portfolio? unit Village at Calabasas, which was completed in 2016.